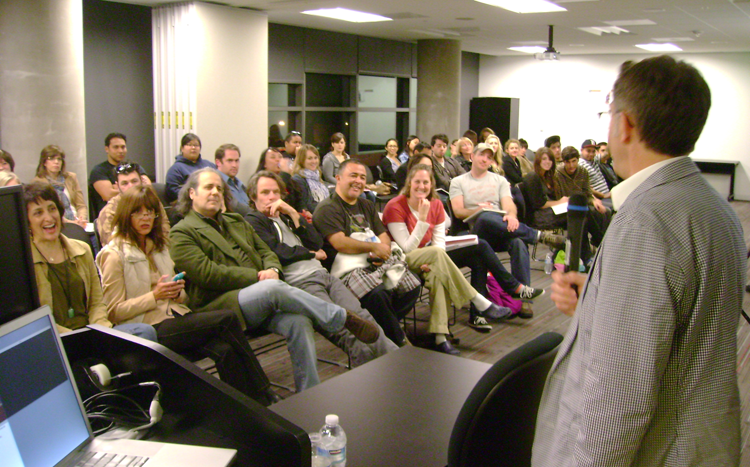 Alphabet Soup Blog » Blog Archive » It Began in NoHo: Thank You Art Institute! It Began in NoHo: Thank You Art Institute! 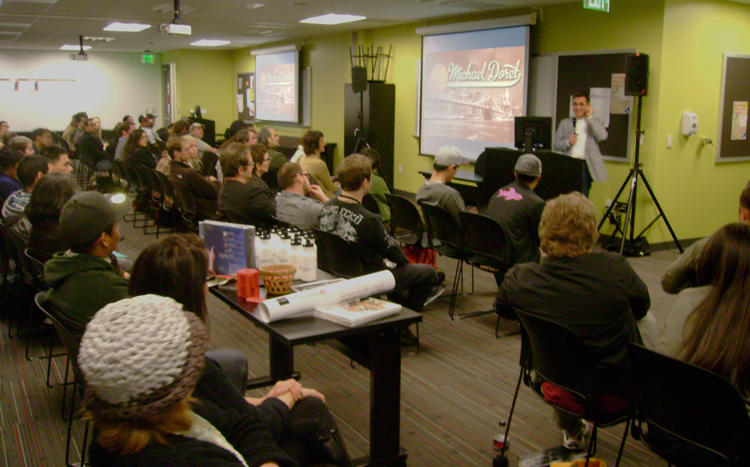 Last Friday I gave a talk to a capacity crowd at Art Institute of California – Hollywood. A big “THANK YOU” goes out to John Judy, the Academic Director of Graphic Design and Foundation Studies who planned the evening, and set it all up. 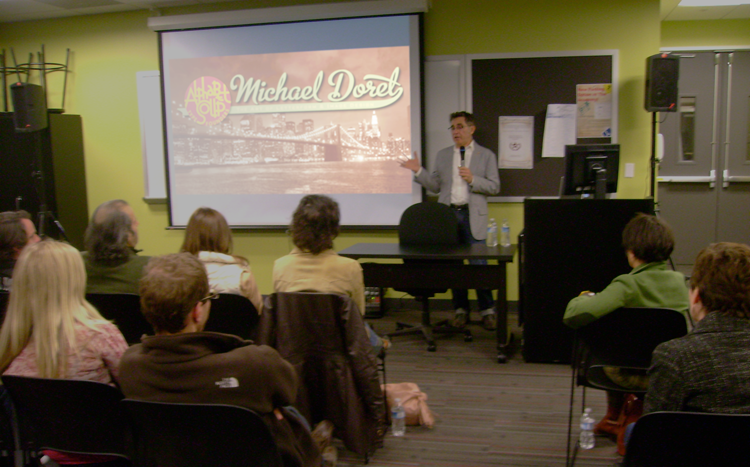 I tailored my hour-long talk “It Began In Brooklyn” to what I expected would be a mostly student crowd, but many professionals showed up as well. The school opened up their space to a triple–wide room with three screens and three projectors—an unexpected layout which actually worked quite well. 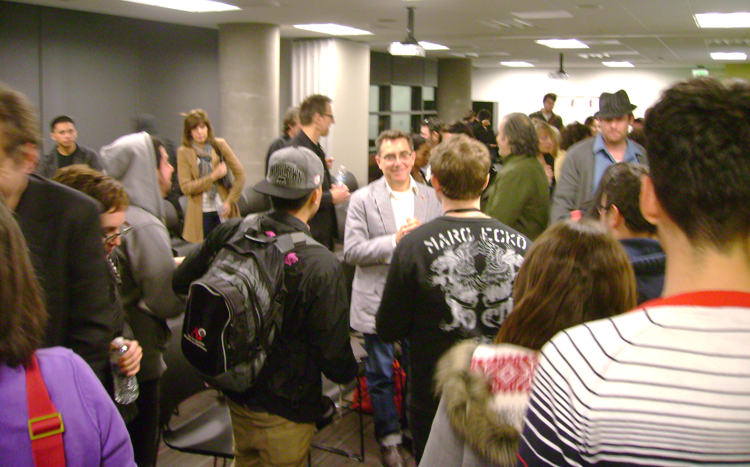 Afterwards we had a Q&A where I tried to answer some great questions from students and professionals. We then raffled off a Wacom tablet, a 1 year subscription to Lynda.com, several signed event posters and a CD of the complete Alphabet Soup Font Collection. I must say that it was really gratifying to see the high interest level displayed by many of the students. All in all it was a great evening. I hope everyone enjoyed it as much as I did! Below, a few photos taken by John Judy after the talk. The Master has his day with the students!